That’s the way I learned it as a child. It didn’t make much sense then. I wondered why it didn’t say, “What you are.” And indeed that was the original and is what is now said. But I had a happy childhood, so I’m sticking with it. I have learned that the version I knew makes some sense. It starts with Wesleyan University in Connecticut ordering from Germany a glass blank for a telescope for their new Van Vleck observatory. The blank was made but delivery was delayed because World War I broke out. When it finally arrived the blank was of such excellent quality that an objective lens substantially bigger than the original plan was made. Using this excellent telescope it was possible then, even adjacent to Middletown and the Connecticut River, to make celestial observations so accurate that the telescope became a pillar of the science of astrometry, the measuring of distances to stars using the parallax shift they demonstrated during the course of a year. This was big stuff at the time and served as the foundation of big stuff that has happened since. So the “where,” at one time was quite appropriate. But “what”? The song says a diamond. That makes good sense. In the days when world class astronomy could be done through smoke and mist the night sky was not marred by jet exhaust and the sea of electric light bathing every human habitation out of deference to those afraid of the dark. Then a bright star could be seen to twinkle and change color because of the chromatic aberration of the atmosphere much as a diamond will sparkle in the sun. Jump forward in time to two months I spent as a young man in a Diagnostic Radiology department in Sweden. Ones options in Sweden are governed in large part by a test everyone takes. The test score is used in deciding who goes to college. Every college has its cutoff, the score below which it will not accept people. And of course everybody tends to go to the most exclusive school they can. Another test determines graduate school options. The most exclusive graduate schools are the medical school. And again by the same process, residencies are offered to medical school graduates. Radiology has the highest cutoff. So radiology residents are pretty close to being the brightest young people in the country. Spending time with them was a great honor and I think the happiest time in my life after childhood. The head of the department was a man of enormous ability and prestige. We all thought the world of him. One of the professors was singularly sociable. Along with professor he had the title “docent.” You may hear that term among museum guides. In Sweden it carries great prestige. The Swedes in my experience are like New Englanders in having no use at all for elitism, trappings of power, honor given only by virtue of having a position and so forth. They just about never say “docent.” But I truly admire this docent and so I would use the word every chance I got, figuring that being a guest I would be forgiven the faux pas but my impulse to be respectful would be understood. Anyway I mean anything in my bad old way of using the word is ruled out by a brief glance. So it had to be carcinoma of the pancreas. Instead of such candor I approached the film and started pointing out loss of tapering, encasement and displacement of very small vessels. I looked around beaming. They gave me a look that meant they knew I had stolen a march, they just didn’t know how. About that time the docent came past and they called him over and asked him what it was. “Carcinoma of the pancreas.” “How do you know?” “Non tapering vessels, encasement and displacement,” pointing to the same places I had pointed out. They all murmured in awe. In the silence following his departure I said, “You weren’t impressed when I said that. Why are you so impressed now?” The answer was that the docent had the rank and had just showed he deserved it. But the Swede will not acknowledge rank at gunpoint, I mean not in his or her heart. So that left them something to gnaw on. Presently one of them said, “Because you are so dogmatic, Linton. You are always so sure of yourself. You could argue either side of any question and sound right. Nobody ever knows whether to believe you.” I think he nailed me pretty good on that one. Hence I try never to ask people to believe me. I try to offer evidence, explain how I interpret it and ask others to think about it. It was into the heady brew of civil but competing minds that a friend offered me a book to read. It was about black holes. I leant it to someone else when I was through. I hope it made its way back to the owner. The author had a sort of mystical interpretation of black holes. He thought we ought to worship them because they apparently represent a situation where the laws of nature must break down and therefore are supernatural. You don’t hear that attitude much any more. So I learned for the first time that a black hole is a concentration of mass so great that light cannot escape from it. And if light can’t nothing else can. I thought, “Of course. You are describing the universe, only time is going the other direction. The universe isn’t expanding, it’s collapsing, which is a lot easier to imagine, and things like stars and supernovas are not explosions, they are implosions. They are black holes going backwards in time. In those innocent days I thought I would be able to get the idea examined by people who knew about such things. Fat chance. But I thought about it for a long time. If the universe is collapsing (as we go Wednesday, Tuesday, Monday) then information is piling up. It has to be piling up. It can’t get out of a black hole. And the universe is getting smaller. Eventually it must pass some state of being a crystal and then assume some regular form, maybe an icosahedron, then dodecahedron, octahedron, cube and tetrahedron. In fact somebody once made a statement that there seemed to be a vague dodecahedron shape to the early universe. I don’t know. I didn’t even keep the reference. It certainly is nothing I’ve heard of since. 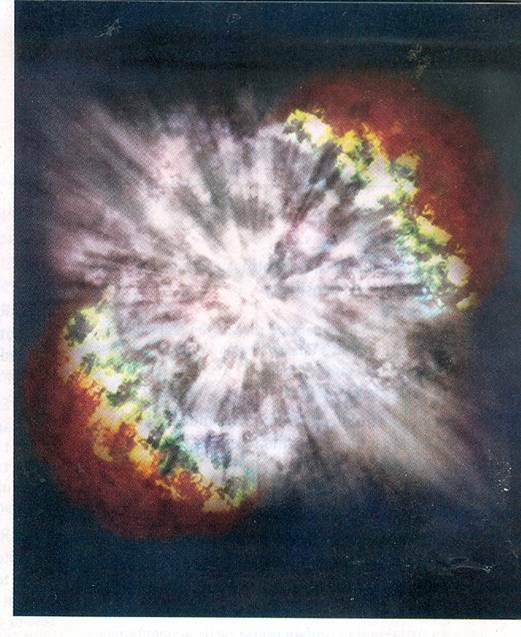 Supernova (Stellar Explosions SCIENCE vol. 337 no. 6097August 24, 2012 page 886. Does is look like a crystal? I don’t know. Your guess is as good as mine. I wouldn’t recommend worshiping it. There have been 66,485 visors so far.